With the global recession receding, confidence has finally made its rebound and the next 12 months promise to be a period of significant change. The capital markets, like many other sectors, are now switching from saving money for survival to investing for growth. Combine this with disruptive technologies, investor money, and competition from emerging markets and start-ups, change will only become bigger and faster. However financial services face one extra hurdle which peers from other sectors don’t: regulatory compliance. This pressure to comply leads to budgets for other commercial initiatives being stretched. Leaders in financial services therefore need to consider adapting the way they manage and deliver change, rather than relying on the latest must have technology to change their environment for them. Put simply: the way change is delivered needs to change. It needs to become fast, flexible and responsive to an ever evolving operating environment. Ask some basic questions: Clarify what exactly is the mission; what are you trying to deliver. Many organisations set out without this and waste a lot of time, energy and budget fumbling around without direction, often with consultants more than happy to take their money. The best way to clarify the mission is often to set out a series of questions – but choose no more than five broad ones that everyone can remember. Involve the ‘disruptives’: Use the information that already exists in the minds of the people who already work for you, and then blend it with external information. At this point, employees who are adept at creativity – regardless of its disruption – need to be encouraged to enter the conversation and be given space to challenge the status quo. Existing habits, beliefs and procedures within an organisation need to be given a good shake to see if they still make sense. Gather only the information needed to answer the questions. No more than is needed. If it doesn’t answer the question don’t bother with it. Be ruthless. It’s important to hold the space during Step Two so that information and ideas can emerge. Don’t close it too early and rush to solutions, but equally time box it so that everyone knows when it’s going to end. Bring the data together: And then formulate answers to the questions you set out in the beginning. This is an iterative process that usually takes several cycles. Initial ideas ebb and flow until the right solutions for an organisation becomes clear. Ideas should be discussed to provide succinct answers (solutions) to your questions. Again, time box this activity to focus the minds of people involved to reach the end game. Turning theory into practice: Once you have an initial set of answers and solutions you need to turn them into actionable plans and ensure the rest of the company is carried along for the ride. Actions should be formulated and prioritised. A list of things needs to be put together that can be delivered over the coming weeks and months. They need to be small enough that they can be delivered within weeks. Once the list is put together a project team and its executive sponsors need to socialise the original questions, the ideas generated and the action plans within the organisation. Feedback needs to be sought and actions and ideas updated as feedback is received. Focus on results: In today’s instant gratification culture results need to come quickly. But this can be done – through short sprints of delivery. The actions generated in the previous step should be prioritised on an ongoing basis and those of the greatest priority should be worked on first. A short sprint might typically be a ’10-20‘: Ten actions in Twenty days. This is long enough to implement a reasonable size change or set of changes, but short enough to get positive feedback and not lose the positive energy of delivery. Repeating this process every 20 days will see an organisation move to a rhythm of realising continual change, which is fundamental to prospering in this competitive, post-recession world. Even with the most complex problems, keeping it simple, is the key to affect rapid change. By following these key steps, financial services can quickly move forward. Following this process allows firms to respond to external pressures such as regulations in an effective manner by helping them adapt and consider changes with maximum impact. 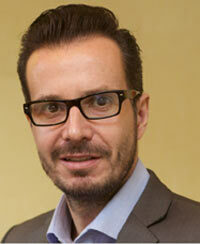 Simon Sear is the Head of the Change Management Practice at the award-winning delivery-focused IT Consultancy – BJSS. Simon has more than 15 years’ experience in Commodities Trading, having first discovered energy trading by accident as an interim IT Manager at Enron in 1998. Since then Simon has had a mixture of Director-level management and consulting roles at banks such as Deutsche and RBS, as well as the more physical players such as BP and Centrica. With a reputation for seeing the big picture and delivering significant change, Simon is a published author of two books: What Every Business Needs to Know about the Euro, and more recently Kencho: the Art of Happiness.